perform at the First General Session of the 2016 Conference. 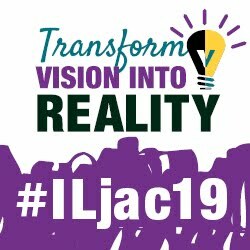 Those attending the 2016 Joint Annual Conference will have the opportunity to sample visual and performing arts featuring Illinois school students. Selected artwork from Illinois public elementary and high school students will be on display in the Grand Ballroom area of the Hyatt Regency Chicago East Tower. There will be 40 pieces of art highlighting a variety of media, including painting, drawing, and printing. The Illinois Arts Education Association has curated this exhibit to be a cross-section of what Illinois students are capable of creating artistically. Participating students hail from THSD 113 (Highland Park), Grayslake CHSD 127, Niles THSD 219, Homewood-Flossmoor CHSD 233, Lake Zurich CUSD 95, Township HSD 211 (Palatine), Maine THSD 207, Oak Park River-Forest HSD 200, Lyons THSD 204, Community High SD 99 (Downers Grove), Chicago Public Schools, Hinsdale CCSD 181, McHenry CCSD 15, Naperville CUSD 203, Arlington Heights SD 25, Medinah SD 11, Kaneland CUSD 302, Indian Springs SD 109, Orland SD 135, Fairmont SD 89, Hinsdale CCSD 181, CCSD 89 (Glen Ellyn), Skokie SD 68, Indian Prairie CUSD 204, Komarek SD 94, Lake Zurich CUSD 95, Henry-Senachwine CUSD 5, Lisle CUSD 202, Homewood-Flossmoor CHSD 233, and Belvidere CUSD 100. In addition, the Monticello Middle School Jazz Ensemble will perform for Conference attendees as they enter the Grand Ballroom for the First General Session on Friday, Nov. 18. The group has also been invited to perform at the SuperState Band Festival at the University of Illinois and at the Illinois Elementary School Association. Both events are new features of the annual conference. For more information about other new features at conference, consult the conference program.